The 7th Annual Les Turner Symposum on ALS and NeuroRepair, held at Northwestern Medicine Prentice Women’s Hospital. 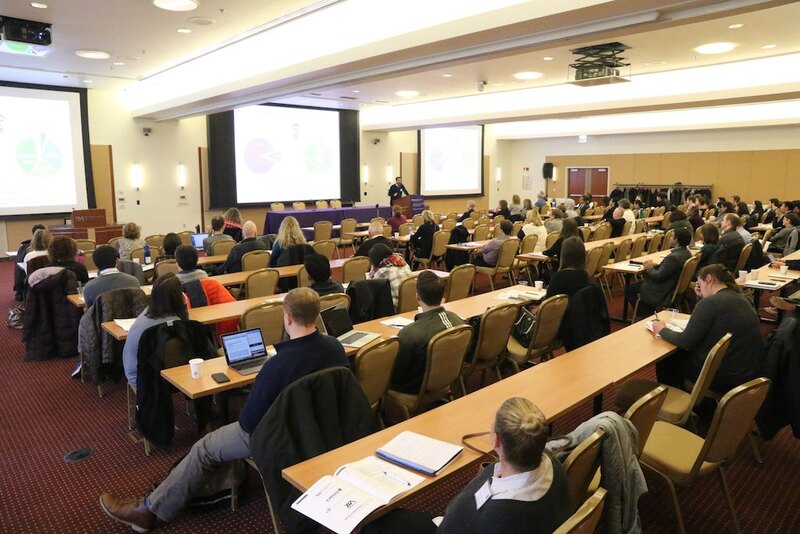 More than 150 investigators, physicians, nurses and patients gathered recently for the 7th Annual Les Turner Symposium on ALS and NeuroRepair, held at Northwestern Medicine Prentice Women’s Hospital. The event was sponsored by the Les Turner ALS Research and Patient Center at Northwestern Medicine and featured presentations on investigations occurring at Northwestern and elsewhere in Chicago, an “Ask the Experts” panel for patients and caretakers, a poster session and a keynote presentation highlighting the process of turning scientific discoveries into treatments for ALS patients. 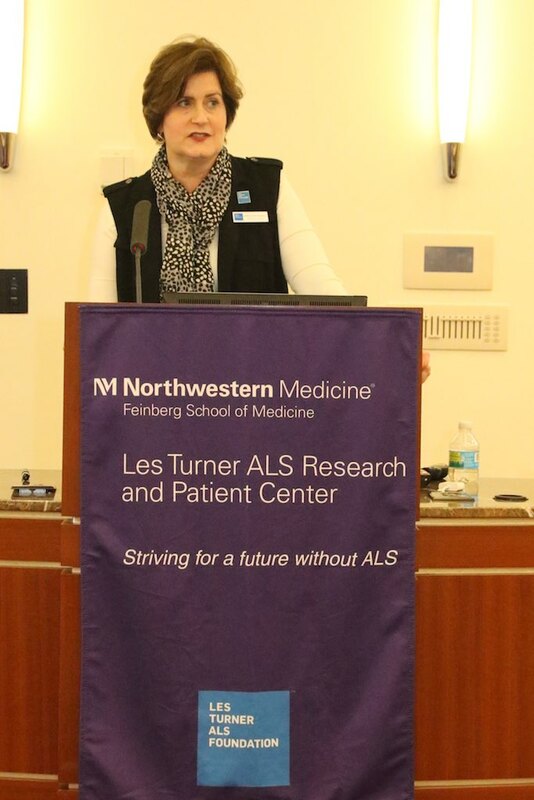 Andrea Pauls Backman, CEO of the Les Turner ALS Foundation, delivers remarks on the progress of ALS research and patient care. ALS, or amyotrophic lateral sclerosis, is a neurodegenerative disease characterized by stiff or twitching muscles and weakness due to muscle atrophy. The root cause is unknown in about 90 percent of cases, but about 10 percent of cases are inherited from a person’s parents and some genetic markers have been identified. The keynote speech was delivered by Christopher Henderson, PhD, vice president of neurology research for Biogen Inc., who spoke about the bench-to-bedside process for ALS treatments, specifically for a prototype class of drugs called antisense oligonucleotides (ASOs), which prevent expression of some ALS-causing proteins. Nathaniel Safren, PhD, a postdoctoral fellow at the University of Michigan, explains his scientific poster. Marc Slutzky, MD, PhD, associate professor of Neurology in the Division of Comprehensive Neurology in the Ken and Ruth Davee Department of Neurology, spoke about the ability for brain-machine interfaces to decode neural activity related to movement and speech, potentially allowing ALS patients to control prosthetic devices or communication aids. Other speakers included Senda Ajroud-Driss, MD, associate professor of Neurology in the Division of Neuromuscular Disease; Evangelos Kiskinis, PhD, assistant professor of Neurology in the Division of Neuromuscular Disease; Han-Xiang Deng, MD, PhD, research professor of Neurology in the Division of Neuromuscular Disease; Hande Ozdinler, PhD, associate professor of Neurology in the Division of Neuromuscular Disease; and Baris Genc, PhD, a postdoctoral fellow in the Ozdinler lab. All speakers are also faculty at the Les Turner ALS Research and Patient Center at Northwestern Medicine. 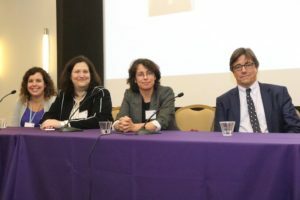 (L-R): Lisa Kinsley, CGC, senior genetic counselor in the department of Neurology; Lisa Wolfe, MD, associate professor of Neurology and of Medicine in the Division of Pulmonary and Critical Care; Senda Ajroud-Driss, MD, associate professor of Neurology in the Division of Neuromuscular Disease; and Christopher Henderson, PhD, vice president of neurology research for Biogen Inc. The day concluded with an “Ask the Experts” panel, giving ALS patients, caretakers and family members of ALS patients the chance to ask clinicians about insurance coverage of ALS treatment, hospital and home care and other questions. The panel featured moderator Judy Richman, RN, director of patient services at the Les Turner ALS Foundation; Lisa Kinsley, CGC, senior genetic counselor in the Department of Neurology; Lisa Wolfe, MD, associate professor of Neurology and of Medicine in the Division of Pulmonary and Critical Care, and previous speakers Ajroud-Driss and Henderson. The founding of the Les Turner ALS Research and Patient Center marked a turning point for ALS at Northwestern Medicine, bringing all ALS fundamental science and translational activities and the Lois Insolia ALS Clinic under one roof. 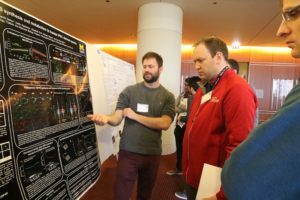 The strong integration of scientific inquiry and clinical care is one of the key features of the Center, according to Ozdinler, also an organizer of the event. 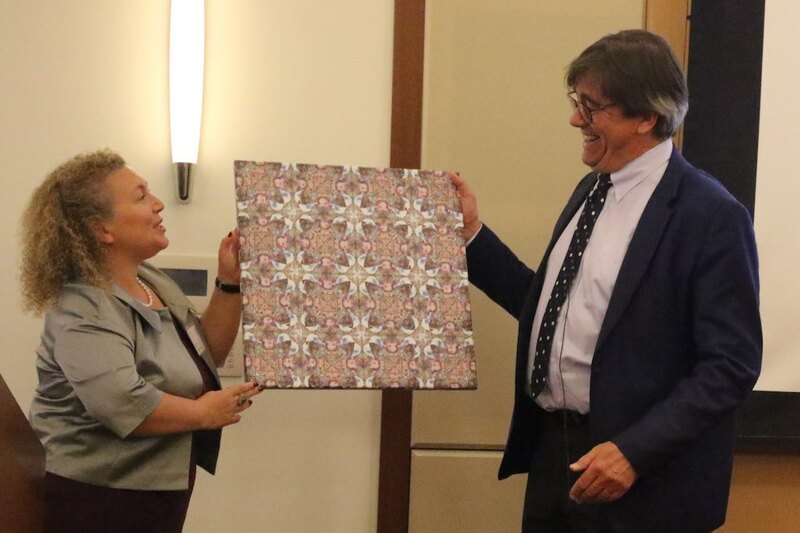 Hande Ozdinler, PhD, associate professor of Neurology in the Division of Neuromuscular Disease, presents a gift of artwork to keynote speaker Christopher Henderson, PhD, vice president of neurology research at Biogen Inc.
With no cure, understanding ALS is an important endeavor, according to Jack Rozental, MD, PhD, chief of Comprehensive Neurology in the Department of Neurology and outgoing interim director of the Les Turner ALS Research and Patient Center. “A disease like ALS is a tough nut to crack, but we have some of the leading ALS laboratories in the world right here,” said Rozental, who has headed the Les Turner ALS Research and Patient Center since its creation in 2014 and will make way in December for Robert Kalb, MD, currently a professor of Neurology and Pediatrics at the University of Pennsylvania. 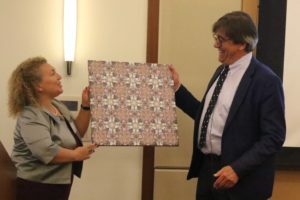 “We thank Dr. Jack Rozental for his leadership and bringing us this far, and next month we welcome renowned scientist and neurologist Dr. Robert Kalb, who will be the permanent director of the Center,” Pauls Backman said.